Lt. Daniel Sunderman began his fire service career in 1994 after graduating from Xavier University with a Bachelor’s degree in Business Administration. His first official fire service appointment was in Batesville, IN as a volunteer fire fighter. He decided to pursue a full time career in firefighting and was hired as a part-time fire fighter in the City of Sharonville in 1996 and was quickly hired into a career position in 1997. 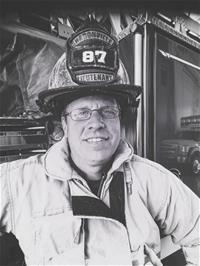 Dan was promoted to the rank of Lieutenant/Paramedic in 2001. Lt. Sunderman has also graduated from the Ohio Fire Executive (OFE) program. The OFE program is a 2 ½ yearlong program developed by the Ohio Fire Chiefs Association. Dan’s primary area of responsibility is the development and management of the fire department’s Public Information Officer Program.